No matter who I or anyone else votes for at the local, state and federal levels, as well as the various measures up for consideration, my biggest concern for the city of Antioch, CA, is the incredible amount of signs all over every piece of fencing that I can see. In fact, some fences are not visible except for the signs! It’s hard enough dealing with all the general trash and mess that blows around, these signs are horribly annoying, and, quite distracting, sometimes obscuring a safe view of an intersection or street corner. I urge the candidates, winner or loser, to respect our/their city and have a team of volunteers to remove every one of your signs. In accordance with city code, you’ve got 14 days after the event that the sign is for – so, on or before November 20th, you need to have all of your signs removed. To be sure candidates are fully aware, there IS a city code that governs where signs can be placed, and, how long after the event they can remain. Based on my reading of the code, there are tons of places around Antioch that the signs are in direct violation of the code. If candidates want to make an impression on me, then they would firstly ensure that every one of their signs is placed in accordance with the city code, and, that they have them removed on or before November 20th. (A) Temporary sign defined. TEMPORARY SIGN shall mean any sign, handbill, or poster which is placed to advertise or announce a specific event, or which pertains to a particular event or occurrence, or which is not designed or intended to be placed permanently. Examples of temporary signs include, but are not limited to, signs, handbills, or posters relating to garage sales, political candidates or ballot measures, concerts, “swap meets,” and the like. Lastly, for all residents of Antioch, the city code can be found at http://goo.gl/9nsGn, and it is fully searchable too! HA.R.P. – the Homeless Animals Rescue Program – continues to need financial help and can use more foster families and volunteers. I have a dog that really needs a home. I have attached a pcture of Yahtze. 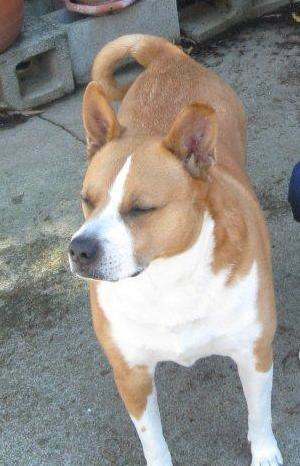 He is a Basenji mix, but larger, at 50 pounds. Yahtze is affectionate, energetic and responds well to instruction given by a strong pack leader (needs an owner who is commanding in his attitude). Basenji’s have a soft yodel bark but they are very protective. Yahtze would make a good dog for someone who wants an only dog who is very loyal. Update: Max, Manny, and Maddie, featured in the August issue of the Antioch Herald, were adopted into wonderful homes. They get along with all the family members and other dogs. Manny and Maddie went to different homes, but they play and get along with the dogs in each of their families and have adjusted very well to their new circumstances. For more information visit www.harp-rescue.org. Who is it? Hank Haney? One of the Harmon brothers? Jim McClean? Michael Breed? David Leadbetter? Martin Hall? Or should we go Old School? Bob Toski? Jim Flick? Tommy Jacobs? I could keep going. It would be nice to spend time with one of these guys wouldn’t it? But then you might have to look at the finances and see if you can afford such and engagement. Several of these instructors command a four digit fee. I propose that you already meet regularly with one if not the greatest teachers of all time. Do you realize that? Each one of you. Who? The golf ball. Really Coach Ron? Really? Yes, really. The question is, are you listening? 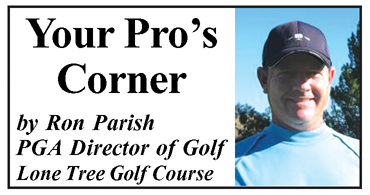 Granted, there are things that a qualified PGA instructor can and will help a student improve in their game. There are times when we don’t realize some things are going on and we need to have someone shed some insight, and getting lessons and an understanding of fundamentals is vital. But the golf ball is constantly teaching us and I don’t believe enough golfers are listening. I try and stress this to my students but I have to be honest, I get frustrated because they aren’t listening. So I will pose a few questions to help you get where I am coming from and hopefully help the golf ball teach you. The bladed ball. This one is pretty darn common with beginners. There is something innate for a beginner here. I think it comes from an uncertainty or doubt because they know they are new to the game, or because a fear to disturb the grass when hitting down on the ball, and so what happens? Blade after blade, singed night crawlers and nervous gophers. What’s the ball telling you? You are hitting the ball on the leading edge not the clubface. What do you do? Check your ball position, possibly move it back in your stance and then keep your eye on the back of the ball and hit down and brush the grass after you hit the ball. A little divot is good for a beginner. If you hit it fat, don’t beat yourself up, just keep at it and you will learn to hit the ball first. Slices. The golf ball is telling you the clubface is open in relation to the path of the club head. Remedy? Start with the grip. Rotate hands towards the back foot (stronger) when gripping the club and move the ball back in your stance until you start to hit it straight or with a draw. Driver that flies low and shoots offline. The ball is telling you the path of the club head is coming in too steep and not sweeping enough. Tee the ball high, keep the ball position forward and really sweep the take away low to the ground. On the way through, pretend there is a small nail sticking in the back of the ball just below the equator and the club head is going to sweep through and drive the ball squarely through the golf ball. A good drive should launch at about 45 degrees. Putts that don’t feel solid and come up short. If everything is square and the path is good, the ball is telling you it needs to hit the sweet spot of the putter. Tape two band-aids just outside of your sweet spot, leaving a small opening to hit the ball, and then practice hitting putts right on it. I bet you will find the ball rolling your intended distance soon. Chips that are chunky. The ball is telling you to hit the little ball before the big one. Move the golf ball back in your stance. Keep stance open. Keep your weight favoring the forward foot and keep your hands ahead throughout the motion. These things will help you meet the golf ball first. Still not getting it? Push yourself. Practice chipping and see how far you can move the ball back in your stance. 2”. 4’, 6’ behind your back foot? Try it and watch what happens, I bet you will start making good contact with the golf ball and you will figure things out. These are just a few examples, there are many more, but my point is mainly made so to help yourself learn. Watch and listen to what the golf ball does instead of getting frustrated at a missed shot and you will be more easily able to make change and improve your game. I hope this helps. Thanks to all the golfers that frequent Lone Tree and for all you do for our course and golf in the area. Please try to bring someone new to the game soon or let them know about a golf program offered here or elsewhere. Someone else is out there who would like to have the fun that you are having with this great game. The East Contra Costa Republican Women Federated will meet on Thursday, November 8 at the Discovery Bay Country Club at 11:30 a.m. The speaker will be Mike Conklin from the Sentinels of Freedom. All Republican women and men are welcome. For reservations or information call (925) 635-5404. Community group Take Back Antioch hosted a candidate forum on Saturday to give Antioch residents a chance to get to know the candidates for city council and mayor. The forum featured mayoral candidates Gary Agopian, Don Freitas, and Michael Leon as well as Jim Davis, Noel Pinto, Mary Rocha, Walter Ruehlig and Monica Wilson who are all running for city council. Current Mayor Pro Tem Wade Harper was not present at the forum, but he is also running for mayor. That’s the second candidates event he missed, including the Antioch Chamber of Commerce debate on Thursday night, October 4. Many of the questions at the forum boiled down to the high crime rate in Antioch and what the candidates would do about it if elected. Candidates were asked question about police staffing and crime reduction, code enforcement and blight reduction and economic development and downtown revitalization. Crime is a big problem in Antioch. On average you are almost twice as likely to become the victim of a violent crime in Antioch as you are in the rest of California. And according to a mid-year report by Antioch Police Chief Allan Cantando, the city’s crime rates have gone up in almost every category this year. As far as blight is concerned, all of the candidates agreed that something needed to be done. Current Mayor Jim Davis said that he has already made strides at reducing crime by recently hiring 5 new officers and community services officers, (CSO’s) as well as volunteers in police service, (VIPS). Mary Rocha stressed that the crime rate wouldn’t drop until more officers were hired. Noel Pinto was in favor of cutting non-critical expenditures and using the savings to create budget specifically to hire new police officers. Walter Ruehlig and Don Freitas were in favor of a new sales tax to hire more officers, while Gary Agopian suggested we take a look at other similarly-sized cities in the state that have a low crime rate and potentially borrow some tried-and-true crime reducing methods from them. Monica Wilson and most of the other candidates seemed very much in favor of community involvement in fighting crime. Wilson suggested boosting the amount of neighborhood watch programs to report suspicious activities and stop crime before it happens. When it comes to blight reduction many of the candidates were in favor of cleaning up and going after the owners of the many abandoned homes in Antioch. Ruehlig suggested educating kids about blight, enforcing maximum fines as a deterrent, and cleaning up freeway exits. Wilson wants to institute volunteer clean-up programs and going after fining the owners of neglected houses. Michael Leon was against raising taxes and wanted to find another way to fight crime, such as neighborhood watch programs. Agopian wanted to increase the amount of CSO’s to go after negligent homeowners and reduce blight. He said if you reduce blight and clean up you will increase home sales and so provide more sorely needed property tax revenue for the city. Freitas was also in favor of more CSO’s but also suggested using the city attorney to lean on negligent homeowners in order to force clean-up of dilapidated property. Davis pointed out his fixing of Mike’s Auto Body as proof that he has worked to end blight in the past and wants to work on a towing program to prevent run down cars from just sitting in place. Pinto agreed with Davis about ridding the city of abandoned cars but also called for community help to identify those responsible for dirtying up the city so they could be slapped with bigger fines and punished. When it comes to developing and improving the economy, particularly in downtown Antioch all of the candidates were in favor of bringing new and bigger businesses to the city. Freitas said that Antioch “desperately” needs to annex the property off o Wilbur to make room for a business park. He wants to fast track development to bring in more city revenue. Leon, who is a business owner himself, said that Antioch is not business friendly. He said he tried to open his business there in 1996 but was so frustrated at the process that he went to Oakley instead. He wants to offer incentives to bring bigger businesses to Antioch. Davis said that he has been working behind the scenes with Wal-Mart – and example he uses to show that he is business friendly. He wants to make Antioch open to all businesses. Pinto said that if elected, he would create a “Delta Valley Joint Venture” that would work with neighboring cities to go after big businesses such as those in biotechnology. He said that jointly, the region could combine to become attractive to businesses. Ruehlig wants Antioch to adopt a pro-business model that would enact new legislation in order to fast track business in the city. Wilson said that Antioch needs to remove red tape and hire an economic director. Agopian had a similar take. He wants to make changes that would fast track the business permit process because he said, “time is money.” He also was in favor of annexing the property off of Wilbur Road. Some candidates for Antioch city council and school board have formed alliances during this election. In addition, there have been some interesting claims made by various candidates running to represent Antioch in different levels of government. First you have Councilwoman Mary Rocha, who is running for reelection, endorsing fellow candidate, and newcomer Monica Wilson. But nowhere does it say Wilson is endorsing Rocha. Then there’s Wilson and Antioch School Board candidate Synitha Walker running joint automated phone calls (robo-calls) to voters asking them to vote for both of them. They have endorsed each other, as well. Plus Walker has been endorsed by Antioch Mayor Pro Tem and Mayoral candidate Wade Harper. Wilson and Rocha have been endorsed by Public Employees Union Local One, which makes me wonder to whom they’ll be beholden when the time comes for contract negotiations. Not usually a good thing for taxpayers. The Antioch Police Officers Association (the cops’ union, not the Antioch Police Department) has endorsed Don Freitas for Mayor. But that’s not surprising since he gave them the very generous and expensive 3% at 50 retirement benefit, as well as the expensive, six-year contract in 2007, which the current council had to buy their way out of – and which has prevented the city from affording all the police we need. Instead we’re down a net 30 sworn police officers, right now. The APOA has also endorsed current Mayor Jim Davis, who voted for the same things Freitas gave them. The difference is, Davis learned the error of his ways and supported the new contract, this year, which reduces city costs for police pensions and pay. Partisan politics in Antioch, race-based endorsements by the Dems? The county Democrat Party has endorsed both Rocha and Wilson for Antioch City Council and Synitha Walker and Deborah Vinson for School Board – all of them minority women, as well as Wade Harper for Mayor – instead of any white Dem man or woman for Mayor, Council or School Board, to the consternation of some of their white, Democrat opponents. Plus the Dems endorsed the 21-year-old, African-American, recent college graduate, De’shawn Woolridge, for College Board, over the more experienced (and white) Dems Daniel Borsuk and Greg Enholm. (Updated 11/3/12) That information is being emailed around as well as that by a statistician who claims if the endorsements were a random decision it would happen only once in every 120 elections. (Updated 11/3/12) Read the response to this issue by the CCDCC’s Endorsement Chair, by clicking here. Regardless of the racial aspect, my question is why is the Democratic Party injecting itself into local, what are supposed to be, non-partisan races? Then again, the Republicans are, too for the first time in this writer’s memory. They have a door hanger that volunteers are distributing to homes of Republican voters with a list of all their candidates for local, state and federal office. Also on the Republican side, the county Central Committee voted to oppose Measure B in Antioch and included it on the door hanger. But after local Republican leaders in Antioch said they were supporting it, the party said go ahead and change the flyers. There have been relatively few attacks in any of the local elections, this year. But, in the Mayor’s race, during the Contra Costa Times/League of Women Voters candidate forum, which can be seen on the Times website, Harper attacked Freitas for the growth that happened during his two terms as Mayor. One problem, almost all the new growth that has happened in Antioch was approved in the late 1980’s and early 1990’s, long before Freitas was elected to the City Council in 1998. Update 10/31/12: I was reminded by a reader, yesterday, that Freitas did in fact approve growth, when he voted to extend the expiring development agreements during his terms on the council. The proof is the implementation of the Residential Development Allocation (RDA) program fee on those new homes, which generated funds that the council spent on various things, such as the six, bluish grey “City of Antioch” signs around town. Then in the Antioch Chamber of Commerce debate, Freitas attacked Gary Agopian and took a swipe at the entire current City Council for voting to hire additional police officers using a federal grant for three years, claiming it was playing politics. Doesn’t Don realize that if he’s elected, he’ll be working with at least two and as many as four of the current council members? Not a good way to offer leadership. Harper missed both the Chamber debate and the Take Back Antioch candidates forum. Harper works swing shift in Tracy as a police Lieutenant, and has to take vacation time to attend City Council meetings. The Chamber debate was on a Thursday evening when he was working. But, why did he miss Take Back’s Saturday morning forum? Earlier this year he said he couldn’t attend a special meeting to discuss placing a police tax on the ballot, if it were held. If he doesn’t have the time to attend council meetings and candidate forums, how does he think he’ll have enough time to be Mayor, which takes much more time? Perhaps he should just wait until after he retires in two years. Word on the street is $150,000 will be spent to help elect Harper as Mayor and that he’s backed by the Seenos, Garaventas and the unions. I’m only aware of one mailer that has been sent out supporting Harper. So unless all that money is going to be spent this week – which I seriously doubt – that probably just isn’t true. The most interesting thing stated in this campaign was by Woolridge who is using the word “Experience” on his campaign signs, which is a bit humorous, if not just plain dishonest. What experience? He just graduated from college in May and is 21 years old. The ones with experience in the race are Borsuk with eight years as an elected member of the County Board of Education and Enholm with eight years as an appointed member of the County Library Board. Woolridge told me he currently works three jobs. How will he find the time to serve in an elected position? Plus, Woolridge has gone a bit over the top by posting a graphic on his Facebook page which includes a photo of Martin Luther King, Jr. with the words “I have a dream,” a photo of President Obama with the words “I’m living that dream,” then a photo of himself with the words “I want to keep the dream alive.” Clever. But, perhaps he should think about King’s other statement about “the content of their character.” Honesty is the most important character trait we need in our elected officials. Then there’s the most interesting endorsement of any candidate in Antioch. That’s the one by Willie Brown, the controversial former Speaker of the California State Assembly and Mayor of San Francisco for Noel Pinto, who has it on his website. Huh? Why would anyone in Antioch want the influence of Willie Brown in our city? The only local endorsement Pinto claims is former Councilman and current candidate for City Clerk, Arne Simonsen. As for Simonsen he also endorsed Don Freitas for Mayor, with whom he formed a coalition immediately following the 2008 election, which they both lost, called the Friday Morning Breakfast Club. Interestingly, Simsonsen states “I do not accept endorsements from elected officials or political parties” and “The city clerk must be nonpartisan in all aspects.” Then why is he endorsing other candidates whose elections he’ll be overseeing, if he’s elected City Clerk? The other candidate in the Clerk’s race, Argentina Davila-Luevano lists her occupation as “Social Worker” but she isn’t. She used to be and has a degree in it. But, in her ballot statement she says “I am president and CEO of California LULAC Institute a nonprofit organization designed to provide services and programs in Education, Health, Housing Social Cultural and Economic Development throughout California.” LULAC stands for League of United Latin American Citizens. She told me she does social work when helping people through that organization, but that doesn’t make her one, currently. Davila-Luevano’s “Top Priorities if Elected” are Women in Positions – Fifty/Fifty by 2020, Ending Violence Against Women – Globally, and Equal Pay for Equal Work. What does any of that have to do with being City Clerk? Nada. (Nothing). Perhaps she’s viewing City Clerk as a stepping stone to higher office where she can pursue those priorities. Two winners in this category. Freitas used a photo that’s at least 10 to 15 years old in his campaign materials. It shows him with all brown hair, but he’s got a little touch of grey, now. One of his friends and supporters told me he jokingly told him, “Don, it’s nice to see your senior picture from high school.” Then there’s Ruehlig who used one that’s got to be at least 5 to 10 years old in some of his materials and on his website. No hat on, though. Pinto has made some statements during the campaign of things he will do to meet with businesses to attract them to town and about other things he wants to do if elected. But, how will he have the time when he works in Berkeley in charge of that city’s parking enforcement? (He recently switched jobs from the City of Oakland). Will he be able to take time off work to be in Antioch during the day or meet for breakfast before going in late for work? It’s possible, since he’s in a management position. Davis also works out of town, in Walnut Creek, but he’s in a management position at a bank and has demonstrated the ability to be in town during the day for city-related matters and make up work during the evening and on Saturdays, when necessary. Wilson stated during a candidates’ forum, that she “hopes to create a strategic economic plan that would cultivate existing business and bring in new business.” That plan has already been done for Antioch and most of it has yet to be implemented. All she has to do is go get a copy of it from City Hall. It’s the 1996 Antioch Economic Development Plan. I would assume every Economic Development Commissioner would have a copy of it. Then she said “Once people have jobs, you’ll see crime go down.” She has that backwards. Wilson should know that the businesses with their jobs won’t come to Antioch until after the crime is down. Wilson put out the most partisan mailer for local office in Antioch that this writer has ever seen. On one side it shows a photo of President Obama and states “Fired Up for Obama – Biden” and “Don’t Stop There” at the top, then “Move Antioch forward by electing Monica Wilson to the Antioch City Council” at the bottom. Then on the other side it states “Add to your Democratic Team” and “Monica Wilson for Antioch City Council – #1 on ballot” at the top of the other side. It provides a list of endorsements of Democrat politicians and organizations. Then it lists her experience of being on the Contra Costa Democratic Central Committee and Policy Issues Chair for the Women’s Caucus of the California Democratic Party, at the bottom, in addition to Economic Development Commissioner. However, Wilson only lists one accomplishment – again, helping with city clean ups, yet says nothing of what she will do if elected. Also at the bottom it states “Ready to Make A Difference.” Then why hasn’t she done so in the position she already holds on the commission? It makes you wonder why she’s really running for the City Council instead of some partisan office. Oh, that’s right, all the partisan seats are held by Democrats and she wouldn’t run against one of them – they’re all backing her. She needs to understand local office is non-partisan and you need to accomplish something before seeking one of the highest offices in our city. Walter Ruehlig wins that award with two ads in the Herald, both dominated by photos of him and some supporters. The first one got him in a little trouble with the priest at his church, St. Ignatius Catholic church, who claimed (unfairly) that it appeared Ruehlig was implying an endorsement by the church and the Fil-Am Society, based there. All the photo showed was Walter and two Filipino-American supporters standing in front of a grotto with a statue of Mary, the mother of Jesus. It didn’t say where it was located, just that the grotto was donated by the Fil-Am Society. The priest sent a scathing letter to this newspaper, which was posted on our website. But, things have been smoothed over and the priest apologized for his over-the-top letter. Rocha’s ads stating “Bring Back Cooperation, Compassion, Commitment” are interesting. I didn’t know they’d gone away. The commitment part I can understand which differentiates her from a couple of the other candidates who haven’t done much of anything for Antioch, before deciding to run for council. Especially since this is Mary’s 28th year in public office in Antioch. She’s said this will be her final campaign, win or lose. If you’re running to improve education, you should probably make sure you spell things correctly. On Synitha Walker’s website it says “Upcomimg Events.” As for one of her events, I have a complaint. She held her campaign kick-off outside of the district at the Straw Hat Pizza in Brentwood. Come on, Synitha, shop Antioch! I like acronyms. I once promoted H.O.P.E. in one of my campaigns, for Homes, Opportunity, Protection and Education. Walker wins the prize this year with her “Vote S.M.A.R.T.” which stands for “Specific, Measurable, Attainable, Results-oriented, Timely.” I assume she’s referring to educational goals and programs. Walker is endorsed by the California Schools Employees Association. The Antioch teachers union is backing three other candidates for School Board, (all white women): incumbent Diane Gibson Gray, newcomer and former principal Barbara Cowan, and former district nurse and teacher’s union rep Linda Anderson (her endorsement is no surprise). The union mailed a flyer to 10,000 Antioch homes and Cowan and Anderson have been passing out more of them in front of Antioch schools. The flyer also states endorsements against Prop. 32 (paycheck protection for union members), and in favor of both Prop 30 (tax the rich) and Measure B (Antioch High improvements). There’s already one former teachers union rep on the school board in Gary Hack. Does Antioch need another one? If Anderson wins, the teachers will have control of 40% of the board. There are currently no racial minority members on the Antioch School Board, even though blacks make up over 17% and Hispanics almost 32% of Antioch’s population. That will change if either Walker or Vinson are elected. I’ve seen two signs about Measure B on school property. One is a Vote Yes on B sign on the fence at Prospects High on 2nd Street, which is inappropriate. The other one is a diagram of the improvements to the Antioch High sports fields if Measure B passes, on the school’s fence at the corner of 18th and L Streets. That one’s probably fine, since it’s just information and doesn’t take a position on the Measure. But the other one needs to come down. Disregard for private property rights? Any candidate who places a sign on private property without permission is trespassing. Would they want someone putting anything on their property without their permission? Of course not. Come on, candidates. Show some respect and don’t be so desperate to win and PLEASE be responsible and take them down within 10 days after the election. After that they’re just visual pollution and frankly, littering. It will be interesting to see what happens next Tuesday at all levels of government. Remember to vote and vote smart. In fact that’s a good place to go to get more information about the candidates. Click on http://www.smartvoter.org/2012/11/06/ca/cc/ Then choose either city or school for local races. It’s the League of Women Voters’ election website, in which candidates post their own information. Some of the candidates have done so and have shared links to their websites there, as well. Good luck to all the candidates and if you lose, don’t just disappear like so many others have done in the past. Get and stay involved. You don’t have to hold elected office to make a difference in our city or schools. Please join us in voting for Walter Ruehlig for Antioch City Councilman on November 6th . We worked with Walter on the committee to bring the July 4th 2012 celebration back to Antioch. We have found Walter to be a man of integrity and good will who can bring together a diverse group of citizens to work together amicably toward a common goal. Walter is currently a board member of the Antioch Unified School District. During his tenure, the District overcame a budget deficit and expanded the District to include the Dozier-Libby Medical High School and helped advance the concept of career-based learning academies in our high schools. Also, API scores have improved consistently during his tenure. Google Walter’s name on the internet to learn more about his accomplishments in education, music appreciation and his efforts for worldwide peace. We are truly fortunate to have a man of Walter’s caliber running for a seat on the Antioch City Council. Congressman Jerry McNerney has received the endorsement of Wade Harper, Tracy Police Lieutenant and Mayor Pro Tem of Antioch. The new 9th Congressional district, in which McNerney is running for reelection, includes the majority of Antioch. “I met with Jerry a couple of months ago and discussed the need to protect Antioch’s water rights. He made a commitment to me that he would stand with me in protecting Antioch’s water rights,” Harper added. Besides introducing the Crime Prevention Act, to expand the FBI’s Safe Streets Program, to establish a National Gang Activity Database, which was referred to committee but never passed, McNerney “brought $750,000 to boost probation services in Contra Costa County and he introduced a bill to improve treatment and awareness of methamphetamine, use during the last Congress,” according to his campaign staff. It was a collaborative effort with U.S. Senator Barbara Boxer’s office, that resulted in the grant being awarded to the County. McNerney also co-sponsored the 2007 bill to increase funding for the COPS program to make grants for public safety and community policing programs. “I am committed to doing what I can to help address the crime rate in our community. Improving public safety is one of my highest priorities,” said McNerney. The new 9th District includes the majority of San Joaquin County and portions of Contra Costa and Sacramento Counties. Congressman Jerry McNerney (D-Stockton) has served the area for nearly six years and is the Ranking Member of the Disability Assistance and Memorial Affairs Subcommittee of the House Committee on Veterans’ Affairs. For more information visit www.JerryMcNerney.com. To view a more complete list of legislation voted on by Congressman McNerney, visit http://ontheissues.org/CA/Jerry_McNerney.htm. Publisher Allen Payton contributed to this article.